The Logitech V200 Wireless Notebook Mouse (they hiring the same team that Microsoft uses for names?) is, well, exactly what it claims to be. 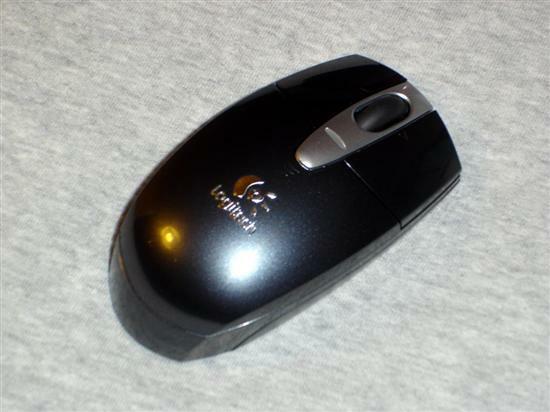 It is a modest sized mouse with two buttons and a scroll wheel. It’ll happily work with your notebook using the tiny, included USB receiver. While this is far from a revolutionary product, it does have a couple interesting features, including a 2.4 GHz radio and an invisible optical system. I’m going to have to come clean, I’ve collected far more pointing devices in my day then I have any ability to rationalize. Mice, trackpads, remotes, and I have been strongly tempted by a Wacom tablet as of late. I graduated from a string of generic mice to one of Logitech’s original MouseMan pieces. Very nice bit of kit for us righties anyway. Since then I’ve had three or four Logitech mice, including an early wireless one, two trackballs and, latest, a Microsoft Explorer 3.0. But let’s get back to the present. I bought the V200 for use with my notebook. In the past I’ve lugged around a Microsoft Trackball Explorer. This is a fairly big unit with a long, weak cable. Unfortunately, my T43 doesn’t have built in wireless, so I was on the look-out for a compact wireless mouse with a USB receiver. I found the V200. The box, well, it isn’t a box. Nothing seems to ship in a box these days. To digress, the V200 ships in what has to be the toughest blister package ever made. I would suggest a Dremel if you have one around. I personally tried a beefy pair of kitchen shears (the kind that happily cut through bone) to little avail. I then resorted to a fresh razor knife and brute force. The package was utterly destroyed in the end while I received only minor injuries (bloody thick plastic managed to but me). Ah, contents. Logitech includes the mouse (nice of them), the USB receiver, a pair of AA batteries, a CD with their mouse tools (be careful not to accidentally install Musicmatch in the process), an installation guide, and a few ads. This is pretty much all one would expect with a mouse, though since this is designed to travel with your notebook a protective pouch might have been a nice addition.